Four Corners Free Press | The independent voice of the Four Corners. April issue now available at newsstands! 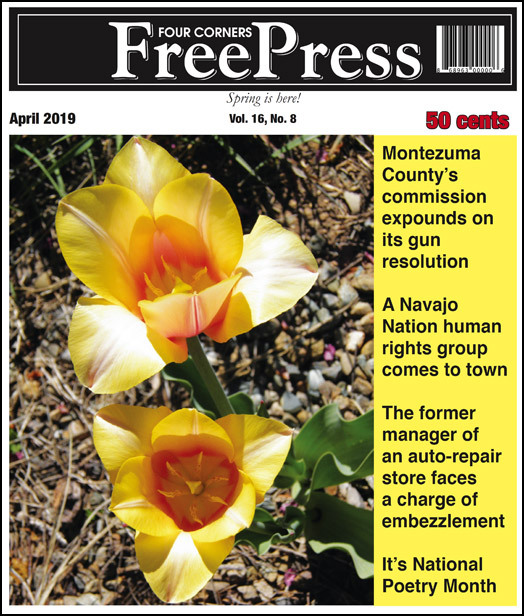 WHAT IS THE FREE PRESS?A monthly publication delivering in-depth news, lively features, and thought-provoking columns on life in the Four Corners. The Four Corners Free Press is an independent, alternative paper with real substance. Every month, we sink our teeth into meaty topics, providing in-depth, comprehensive news stories on important local and regional issues that affect our readers. Thorough, balanced, in-depth news coverage by award-winning, experienced journalists who are familiar with the community and region. The liveliest Opinion section in the Four Corners, with a rotating group of columnists writing everything from serious political commentary to humor. A perennial readers’ favorite: Our Crime Waves section describing local misdeeds. Crime Waves is available only in our print edition. A Health section with columns and articles on a variety of health and wellness topics. A comprehensive Arts & Entertainment section to tell our readers what’s going on in the Four Corners. We offer feature articles; reviews of books, music and movies; and calendars of cultural events, live music, and other happenings. * Cortez Recreation Center, 425 Roger Smith Ave.
* Dolores Food Market, 400 Railroad Ave.
* Magpie Newsstand Cafe, 707 Main Ave.
* In front of El Rancho, 900 Block Main Ave.
* In front of Francisco’s, 619 Main Ave.
* In front of Steamworks, 801 E. 2nd Ave.
All contents copyrighted. No reprints of articles or photographs without permission.